History is full of dangerous duos. Mary Kate and Ashley Olsen. Bert and Ernie. Thelma and Louise. 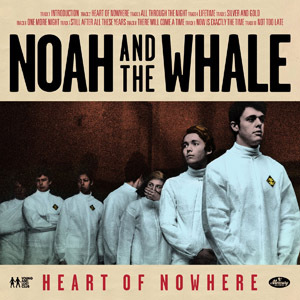 But none may have a more epic story than Noah and the Whale – and the band of that title lives up to their namesakes’ greatness. The English group has long been wowing audiences with their indie-rock bluegrass sound and the team’s latest disc, Heart of Nowhere, exhibits a maturity and quality their fans have come to love and appreciate. The entire album is a very solid artistic endeavor, but a few of the tracks really stood out to me. “Lifetime,” for example, opens with the beautiful string sound N&TW have perfected and, in my mind, trademarked. The lyrics, too, speak perfectly to the young adult angst of commitment, freedom, what-am-I-doing-with-my-life??? we all (or am I the only one over here?) experience or have experienced. The refrain, “Are you ready to make that call?/It’s going to be a lifetime” makes me want to listen to this song all day. Such a good question! “There Will Come a Time,” too, is an especially catchy track with a light-hearted narrative of pursuit of the ever-elusive seemingly-perfect female. Moral? You might catch her, but it won’t be tonight. Of course, the title track, “Heart of Nowhere,” is also well worth a mention. Cue the strings again – and the inspirational message this time around. The song urges, essentially demands, an escape from the cautious lives of our ancestors and an embracing of all that is great about youth: life, love, and liberty. This is not only an album for tried and true fans, but also any music lover looking to expand their repertoire. Definitely worth a listen!